5 bedrooms, 3 bathrooms, living room, dining room, kitchen, front porch. MW, DW, W/D, 4 Cable TVs, Gas Grill, WiFi/DSL. POOL PRIVILEGES @ DAYS INN BEDS: 1 King, 2 Queen, 1 Doubles, 2 Single, 1 Sofa Bed. Accommodates 10. NO PETS, NO SMOKING. Great location for a Jekyll vacation with lots family or friends. We enjoyed this well equipped cottage. The floor plan is great for visitors as they have their own wing upstairs and down with two washrooms. The bikes, basketball net and beach toys were a big hit with the grandchildren when they visited for March Break. This was our 2nd stay at Island Breeze, and again, everything was wonderful. We got to Jekyll earlier than expected, and the staff was on it with getting us right in. The home location is perfect, just a quick stroll to the beach, and a short bike ride to Horton Pond and Driftwood Beach. There are beautiful bike trails to get you to the Historic District or even back up to the Beach Village. We love sitting on the front porch at night and listening to the waves. The layout of the house is perfect for everyone to have their privacy and quiet. This home is very well organized, clean and up to date, and the Jekyll Realty staff was great to work with throughout the whole process. We highly recommend Island Breeze, and we will definitely be booking again in the future! Suited us well , conveniently situated to activities and events on island.we enjoyed it but have 2 suggestions for owner,. Because it is winter months we have a variety of coats and a coat tree would be appreciated as well as necessary . Also bathtubs need to be replaced or refinished. We have been here for two months and still have March to look forward to. Island Breeze is a bright, well-equipped house that has met all our needs and more. This home is beyond words. It truly made the vacation. We had a group of 14 on Jekyll, a couple stayed at the holiday Inn down the road, but we had everyone over for multiple dinners. There is a large beautiful dining table and stools at the long kitchen bar, perfect to accommodate everyone for meals. The location was perfect. You could sit out on the front porch or grill out in the driveway and hear the waves, then have only a 2 minute walk to the beach. The layout of the house was great too. We had age ranges from 4-80, & the privacy and space was perfect. The kitchen has all cabinets/drawers conveniently labeled. The colors, decor and layout of the house are so welcoming and homey. Plenty of beach toys, they even have bikes available to use, books inside, toys/games for kids, gas grill, I mean..there's literally something for everyone! Your beach access point is MAYBE a 2 minute walk, it is so close, and a beautiful beach to relax on, in August we hardly saw 10 other people looking either direction. We rode bikes everywhere, the Horton Pond is not far, a great chance to see gators and turtles. Driftwood beach, not far. The fishing pier also is maybe a mile or 2 down the road. Such beautiful bike trails on Jekyll. It is an amazing place to be, when you have such a great place to call home during your stay, it makes makes it even better. 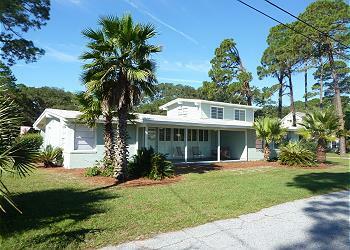 We had no complaints, everyone at Jekyll Realty was very helpful and kind through booking, arriving and leaving. Can't wait to be back next year! It was great! Our children have been coming to Jekyll their entire lives, and now are bring their children. The house is very attractive, comfortable, and convenient having a closed carport for bicycle storage. The bike paths are great and the scene of nightly bike rides to the Dairy Queen as well daily rides all over the island. We also enjoy golf, visiting the historical part of the island, and the beach. We always eat lunch on the porch of the Club, in the grand dining room, and at the Crane Cottage. We also have pizza at Redbug at least once. We had the absolute best time at Island Breeze. We had a big family but the 5 bedrooms accommodated us perfectly. I have rented homes on Jekyll for years and this house was by far the best equipped I have stayed at. The beach closet full of goody's and the bikes in the garage made our stay even easier. The beach access does disappear at high tide but for our little kids this offered an excuse to have lunch and rest and our big kids enjoyed floating in the waves during high tide. Everything was very well maintained in the house the beds were nice and there were plenty of extra pillows and blankets. The house was perfect for a big family with lots of seating for meals. The grill was nice and all of the cookware was perfect. There was not one thing that I found through out the week that I had to go out and buy. Thank you for the use of the house as it provided us with a much needed family vacation. We enjoyed everything this property had to offer our family of 12: 5 bedrooms, 3 bathrooms, bed sizes, upstairs,downstairsm layout of the house, beautiful updated kitchen, large dining table, front porch,2-car garage, bikes and beach chairs to use. Also, the end of the street was safe for our grandchildren and the beautiful sunrise we enjoyed many mornings were breathtaking. A litte drawback was: at the end of the access stairs to the beach, water was trapped and deep, making it useless for us to approach the beach. Could sand be replaced at this spot? We watched other young families attempt to get to the beach and they struggled as well. We each had a most delightful time here and appreciate all that you did in working with us to make our stay most enjoyable. Island Breeze has by far been the best rental unit yet and Jekyll Realty was wonderful. The home was more than adequately stocked and just beautiful and felt like home. It made our vacation a million times better. Very good experience...we would rent this cottage again. 5 stars plus! It was very convenient to find the bedrooms at opposite sides of the living room so grand-parents an young parents could find a silent retreat. The kitchen was well equipped. Lots of toys for the kids! A place to come back! Great two weeks. Had a great time riding on bike paths. Our 91 year old mother brought her three wheeled bicycle and had a great time riding around in the shade at the Club and shops. Even got her on the bridges! The new additions to Jekyll are great. Glad there building limits, so that Jekyll won't ever be crowded like St. Simons. We played golf and enjoyed the beautiful course. We enjoyed relaxing with 4 generations of our family. We have already put deposits down for 2 weeks next year.